Our Best of Australia Escorted Tour delivers the essence of this exceptionally welcoming and beautiful destination beginning in the Mornington Peninsula region of Australia’s famous Sandbelt before continuing to Melbourne, Tasmania and Sydney. This fully managed, fixed itinerary of 12 nights and 6 rounds includes Royal Melbourne, The Metropolitan Club, New South Wales and Barnbougle Lost Farm. Non-Golfers will enjoy city tours, vineyards, cities and the Sydney Opera House. ... Read More. We begin on the beautiful Mornington Peninsula located 60 minutes south of Melbourne on Port Phillip Bay. 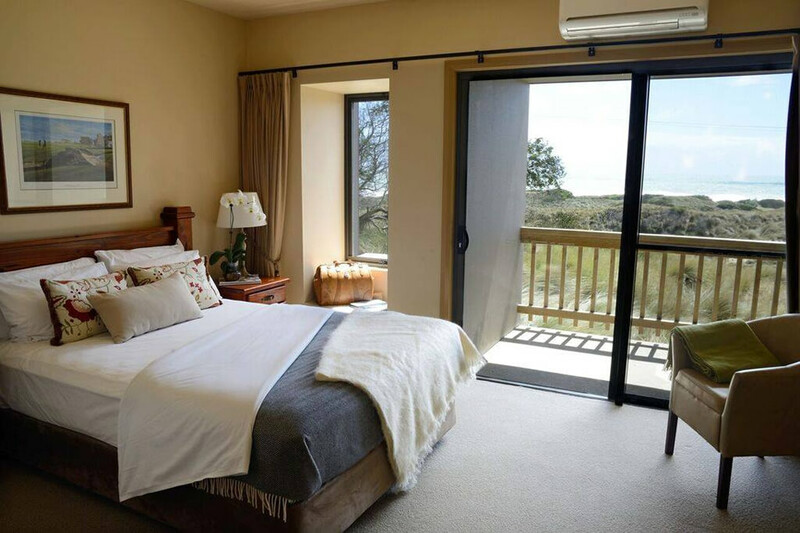 The peninsula offers a dazzling collection of open and sheltered beaches, charming coastal villages, boutique wineries, acclaimed restaurants, geothermal springs and Sandbelt golf. We will play The National Golf Club, home to four layouts each ranked among Australia’s top 100. Next we make the short drive to Melbourne, the capital of Victoria. At the city's center is the modern Federation Square development with plazas, bars, and restaurants by the Yarra River. In the Southbank area, the Melbourne Arts Precinct is the site of Arts Centre Melbourne – a performing arts complex – and the National Gallery of Victoria with Australian and indigenous art. The golf is delightful including Metropolitan and Royal Melbourne West, ranked No. 11 in the world. It hosted the Presidents Cup on two occasions and is a masterpiece stemming from the genius of the legendary architect Dr. Alister MacKenzie. After three nights in Melbourne, we catch a short commercial flight to Launceston in Tasmania. From here we will make our way to Barnbougle, a name that represents two iconic courses, true golfing treasures for both the enthusiast and social golfer. At Barnbougle Dunes by Tom Doak and Barnbougle Lost Farm by Bill Coore of Coore & Crenshaw, you’ll find golf inspired by the seaside classics of Scotland and Ireland. After three nights in Tasmania, we fly to Sydney for the final leg of this Escorted Tour. Sydney is the state capital of New South Wales and the most populous city in Australia. Located on Australia's east coast, the metropolis surrounds the world's largest natural harbor and sprawls towards the Blue Mountains to the west. We will enjoy three nights at the Four Seasons in this breathtakingly spectacular city making time to play world # 43 (GOLF Magazine) New South Wales and to tour the iconic Sydney Opera House. If you enjoy combining your love of golf with a passion for travel, you’ll find a lot to like about this Escorted Tour. Every aspect is fully managed from the handling of your luggage and equipment to hotel and golf course check ins. Various meals, guided sightseeing, carts / caddies, local taxes, service charges and gratuities (excluding caddies) are included. Best of all, this PerryGolf vacation promises an ideal opportunity to join a group of like-minded new friends. Custom golf tours are available which you can price entirely online using our exclusive online trip calculator at QUICK QUOTES℠ Of course, we always welcome the opportunity to assist you personally at 800.344.5257 or Information@PerryGolf.com. Arrive at Melbourne airport where you will be met by PerryGolf staff who will assist you to your private transfer awaiting to take you to your Mornington Peninsula accommodation, Jackalope Hotel. The rest of the day is free to relax and enjoy Jackalope. The Welcome Dinner will be hosted at leading restaurant nearby. GOLF: The National Golf Club is a private members golf club and Australia's first to offer access to 72 holes of first-class quality golf offering incredible variety and endless challenges. All four courses are regularly included in the listings of Australia's Top 100 courses. Your golf on the Old Course will be punctuated with spectacular views of the coastline, abundant challenge and great variety from the premier Robert Trent-Jones Jnr course in Australia. SIGHTSEEING (Non-Golfers): Today you will explore the many attractions on the Mornington Peninsula. See rugged surf beaches, stunning coastal scenery, as well spending some time visiting the seaside town of Sorrento for some retail shopping. If time permits, perhaps a stop in at the Peninsula Hot Springs for a relaxing swim or massage could be organized. SIGHTSEEING (Group): Enjoy a half day wine tour of the Mornington Peninsula. The Peninsula is a glorious tapestry of changing topography, vegetation and cultivation lending itself to be one of Victoria’s leading food and wine regions. Some of the most picturesque wineries in Victoria can be found throughout this area. Regarded highly as a quality cool climate wine-growing region, you will find some of the best Australian examples of Chardonnay, Shiraz and Pinot Noir. Enjoy seated private tastings, mouth-watering farm grown produce and meet a variety of artisans throughout this pristine coastal wine region. Lunch is included at one of the local vineyard restaurants’ before you transfer to your accommodation in Melbourne. SIGHTSEEING (Group): Get ‘Inside and Outside’ to really experience Melbourne like a local. Get your bearings as you explore Melbourne’s grooviest streets, parks and hidden laneways. Get your caffeine fix from one of the quirky laneway cafes that Melbourne is so famous for. You’ll be quick to see inside the heart and soul of the city, and come to realise just why we love Melbourne. After lunch, you will be able to see a few other parts of the city from the comfort of your vehicle as you will explore The Golden Mile and heritage buildings, Federation Square, the Queen Victoria Market, Albert Park Lake and Melbourne’s beautiful beachfront. GOLF: The Metropolitan Golf Club in southeast Melbourne has earned a sterling reputation across the globe as the best conditioned year-round golf course in Australia. Cockatoos and lorikeets provide the soundtrack for this challenging, beautiful Sandbelt course which features couch grass fairways and large, immaculate bent grass greens that are mown to the edge of the bunkers. Metropolitan remains a regular host for the major professional tournaments in Australia, such as the Open, the Masters and plays host to the 2018 World Cup of Golf. SIGHTSEEING (Non-Golfers): Enjoy a day exploring the Yarra Valley. As one of Australia’s leading wine making regions, just a short drive (approximately one hour) from Melbourne, the Yarra Valley is an ideal destination for a day trip. With a picturesque backdrop of the Yarra Ranges as well as renowned restaurants throughout the area, wine and food lovers alike will revel in everything the Yarra Valley has to offer. Enjoy lunch at one of the regions picturesque vineyard restaurants, followed by more time exploring the region meeting local characters and sampling wine from boutique wineries. Alternatively, we can visit the Healesville Wildlife Sanctuary. Regarded as one of Australia’s leading wildlife reserves, Healesville has over 200 species of Australian birds and animals in pristine ‘Aussie’ bush land that includes the new Kangaroo Country area. GOLF: Royal Melbourne Golf Club - West Course is rated # 11 in the world by GOLF Magazine and generally considered by most to be the finest course in Australia. Alister Mackenzie’s Golden Age masterpiece is a strategic gem that demands accuracy off the tee to create the proper angles into the greens, which are heavily undulating and extremely fast. Mackenzie gives golfers multiple options, rewarding the courageous who challenge bunkers to create a better scoring opportunity. It will be great to experience this course on the back of the 2019 President’s Cup. SIGHTSEEING (Non-Golfers): Melbourne is a city renowned for great art and delicious food. People travel from far and wide to visit international exhibitions, laneway street art and taste the best food this city has to offer. This four-hour walking tour takes guests to the best of Melbourne’s ever-changing art scene from showcasing National Gallery of Victoria to discovering significant art that is all around us on laneway walls and decorating our prominent boulevards. The food scene is also explored with some of Melbourne’s finest coffee and handmade chocolates. Foodies are in for a real treat with a stop at a great city restaurant to enjoy shared plates with a glass of wine. Depart Melbourne and take a commercial flight to Launceston. SIGHTSEEING: The Cataract Gorge Reserve on the South Esk River is a unique natural formation just minutes from central Launceston. The Gorge has walking tacks, swimming pool, the world's longest single span chairlift, a restaurant, cafe, a suspension bridge and panoramic lookouts with spectacular views. Peacocks and native wildlife add to the experience. On the southern side of the river is First Basin, featuring a swimming pool and an open area surrounded by bushland. This part of the Gorge is popular with locals for picnics and barbecues. On the shady northern side, known as the Cliff Grounds, is a Victorian garden with ferns and exotic plants. Relax on the rolling lawns, take shade under the rotunda and enjoy lunch with a view from the restaurant. GOLF: Barnbougle Lost Farm is a Bill Coore (Coore & Crenshaw) design opened in 2010 with 20 holes. Mr. Coore is one of the modern minimalist masters whose imaginative routing through the dunes and alongside Anderson Bay has created a unique links layout not unlike Kingsbarns in St Andrews. GOLF: Barnbougle Dunes was designed and constructed by world renowned U.S designer Tom Doak along with Australia’s Michael Clayton. Opened in 2004 this traditional links style layout plays over 200 acres left largely as it was found by Doak’s minimalistic design approach and a philosophy that traditional, strategic golf is the most rewarding. SIGHTSEEING (Non-Golfers): Enjoy a day trip to Wineglass Bay and the Bay of Fires. Wineglass Bay is part of the Freycinet Peninsula, an outcrop of wild, pristine coast land on Tasmania's east coast. Encompassed within the Freycinet National Park, it is considered one of the top ten beaches in the world. Nestled in the iconic Hazards range and bordered with pink granite peaks, Wineglass Bay is the most photographed view in the entirety of our island state. The Bay of Fires is on the north eastern coast of Tasmania extending from Binalong Bay to Eddystone Point. The bay was given its name in 1773 by Captain Tobias Furneaux in Adventure, who saw the fires of Aboriginal people on the beaches. Transfer from your hotel to Launceston airport where you will fly to Sydney for the final portion of your tour. The afternoon will be at your leisure to settle in at the hotel or stretch the legs on the organized 90-minute walk around Sydney’s historic The Rocks district. SIGHTSEEING (Group): Join Sydney’s most experienced tour guides on a 90-minute leisurely walk around Sydney’s historic The Rocks District. Hear the story of Sydney from the beginning as you stroll along the shoreline of sparkling Sydney Harbour with views of the Sydney Opera House, the Sydney Harbour Bridge, past Campbell's Cove and Cadman’s Cottage. Wander down hidden alleyways, into shady courtyards, along cobbled lanes, discover the nooks and crannies, get up close and personal with the living history and heritage of Australia's first British settlement. SIGHTSEEING (Group): The morning is at your own leisure to relax at the hotel or see some other Sydney sites tour before you enjoy a long lunch Sydney Harbour Lunch Cruise. You will board one of Sydney’s most recognisable vessels for a lunch cruise on arguably one of the best harbours in the world. Combine million-dollar views with a sumptuous lunch and see all the main sights from the water! GOLF: New South Wales Golf Club is a regular among the world’s top 50 clubs, currently ranked #43 by GOLF Magazine. The character of the course is unique, a links style course set amongst the hills and valleys that hug the rugged Pacific Ocean coastline boasting magnificent ocean views as backdrop. SIGHTSEEING (Non-Golfers): Enjoy a tour of the Sydney Opera House with shared tasting plates included. The Sydney Opera House is a multi-venue performing arts center in Sydney. It is one of the 20th century's most famous and distinctive buildings. Designed by Danish architect Jørn Utzon, the building was formally opened on 20 October 1973 after a gestation beginning with Utzon's 1957 selection as winner of an international design competition. The Government of New South Wales, led by the premier, Joseph Cahill, authorized work to begin in 1958 with Utzon directing construction. The government's decision to build Utzon's design is often overshadowed by circumstances that followed, including cost and scheduling overruns as well as the architect's ultimate resignation. Farewell Dinner at a leading restaurant nearby. The original National course (Old Course) was open for play in 1988 and was designed by leading golf course architect Robert Trent Jones Jnr. This course is a generally hilly course combining amazing coastal views, challenging ball carries and slick, undulating putting surfaces into a test of golf not previously seen in Australia. A number of holes provide spectacular views with the standout hole in terms of beauty being the 7th hole. A par 3 of 135 metres, it plays over a cavernous ravine to a large green which runs from left to right. The backdrop to this hole is the coastline of the Mornington Peninsula heading down to Portsea. There is really only one place to hit the ball...on the green. The course comprises a number of holes with ocean views, a number of "inland holes" and all are framed by the natural tee tree and Moonah trees which are common on this part of the Mornington Peninsula. The Metropolitan Golf Club in southeast Melbourne has earned a sterling reputation across the globe as the best conditioned year-round golf course in Australia. Cockatoos and lorikeets provide the soundtrack for this challenging, beautiful Sandbelt course which features couch grass fairways and large, immaculate bentgrass greens that are mown to the edge of the bunkers. Metropolitan remains a regular host for the major professional tournaments in Australia, such as the Open, the Masters and the PGA. Considered by many the finest course in Australia. This is a strategic gem that demands accuracy off the tee to create the proper angles into the greens, which are heavily undulating and extremely fast. Mackenzie gives golfers multiple strategic options, rewarding the courageous who challenge bunkers to create a better scoring opportunity. No. 5 is a terrific par-3, heavily bunkered and frightening. Lost Farm is unique not only for its sheer beauty in a delightful setting on the Northeast coast of Tasmania, but also for featuring a 20-hole layout, all of which are playable in one round. Interestingly enough, the sand dunes on Lost Farm are steeper than those on the original Dunes layout. Holes run adjacent to the Forester River and into the Tasmanian hinterland. Coore & Crenshaw devised wide fairways, strategic penal bunkers and large, undulating greens to create a course considered among the finest anywhere. Shortly after Tom Doak and Michael Clayton’s creation opened in 2004, it shot to the top of the rankings, both in Australia and throughout the world. They carved this links out of the Anderson Bay dunes and the fescue and bentgrasses deliver a unique experience. Stunning panoramic views mark the back nine and the fourth hole features the largest bunker in the Southern Hemisphere. Truly a unforgettable golfing experience in this remote, serene corner of the Earth. New South Wales Golf Club delivers an unforgettable experience as one of the top courses in the world. Surrounded by the Pacific Ocean and located in the Botany Bay National Park, this delightful links also offers a beautiful view of the stunning Sydney skyline as golfers finish their round. The 6th hole, a par-3 measuring 193 yards, is memorable and penal. Water and rocks protect a tiny green to the left and a steep slope defends the right side. 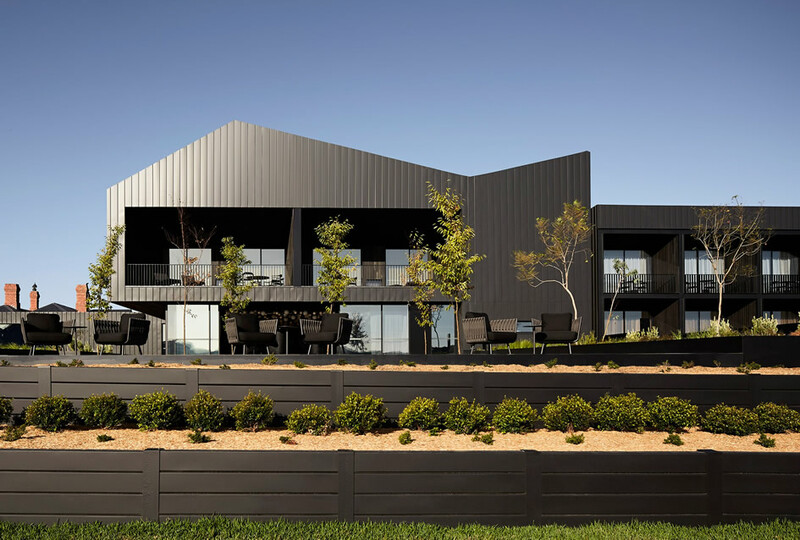 Set on a pristine property amid the world-renowned Mornington Peninsula wine region, an intoxicating vineyard acreage frames a luxury hotel, unique in both destination and design. Jackalope’s daring emprise, a delicate interplay between the ideal and surreal, is delivered through boldly curated installations and collaborations with some of the world’s principal designers. The 46 designer dens deliver absolute in-room reverie. Interiors are lavished with custom-made comforts, while floor-to-ceiling windows and private terraces connect the room’s contemporary design with its country setting. Crown Promenade Hotel gives you plenty of room to move whether you want to work or relax. 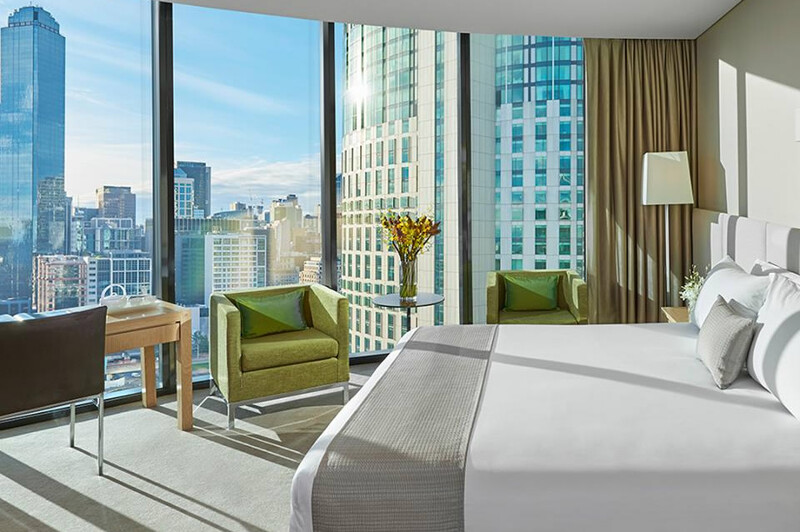 Crown Promenade Hotel is located in the heart of Melbourne's vibrant Southbank entertainment precinct. 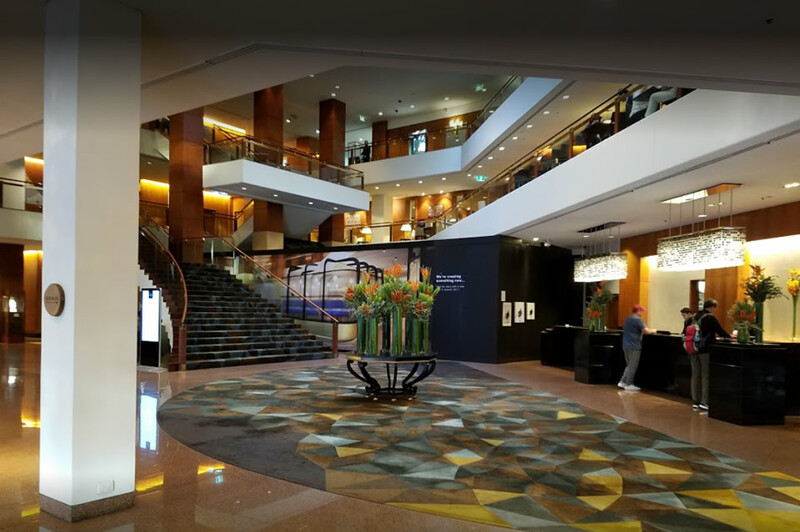 Directly linked to the exciting Crown Entertainment Complex by airbridge, Crown Promenade Hotel is also close to the CBD, the Melbourne Exhibition Centre and many of the city's most famous arts and sporting facilities. Every room features quality furnishings and original art by local artists. Every one of our 465 guest rooms offers nearly 400 square feet of stylishly appointed space in a variety of configurations. There are also studios and suites available. Barnbougle Lost Farm has two types of accommodation. The Queen Suites are an open plan hotel style room with a queen size bed, bathroom, tea and coffee making facilities. The Double Queen Suites are an open plan hotel style room with 2 queen size beds (in the same room), tea and coffee making facilities and a central bathroom. Both room types have views over the spectacular golf course or pristine Andersons Bay. Your local ground transportation will be provided throughout by comfortable air conditioned motorcoaches ensuring a relaxing and safe travel environment. Your PerryGolf Host will accompany you throughout the tour and be present at all social functions, taking care of the finer details. This way you can relax with complete confidence that the logistics of your vacation are in expert hands. Non Golfers will typically have organized touring options on golf days and dependent on the final numbers, an additional driver/guide may be added as required.